Cannabis grower Cresco Yeltrah will launch an advertising campaign on 9/27/2017 to alert Pennsylvanians about the state’s medical marijuana program. In this photo, a detail from one of the company’s ads. Before a single seed has been legally sown, a cannabis producer and dispensary operator is launching the state's first-ever marijuana marketing campaign. Its purpose: to alert Pennsylvanians to the medical marijuana program and get them thinking about it. Cresco Yeltrah was among 12 growers selected in June by the Pennsylvania Department of Health. The company, which is partnered with Illinois-based Cresco Labs LLC, will cultivate and process marijuana in Brookville, about 100 miles north of Pittsburgh. It is also set to open dispensaries in Butler and Pittsburgh. The company will spend nearly $500,000 on its outreach effort, said Cresco Labs CEO Charlie Bachtell. The money will pay for billboards, newspaper and magazine ads, and a social-media blitz. The first phase of the campaign includes a set of three images. 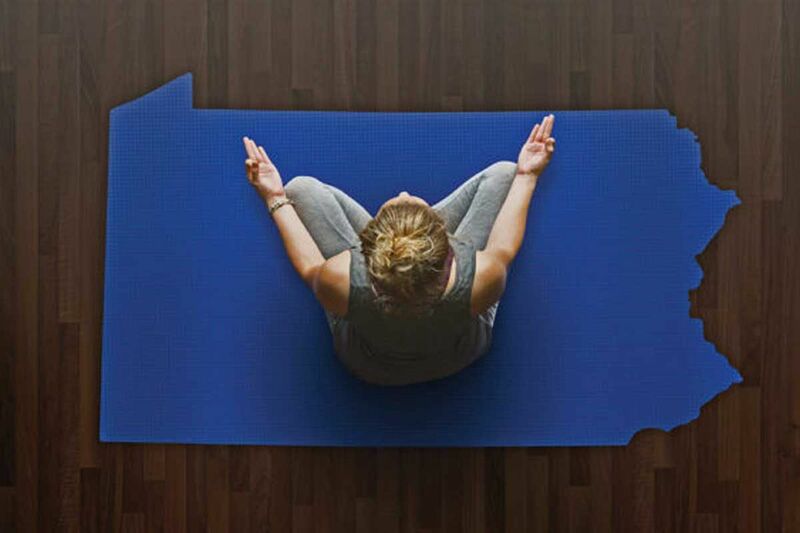 In one, a woman sits in a lotus position on a Pennsylvania shaped-yoga mat: "Welcome to a State of Relief," the text reads. A second features a waffle in the shape of the Keystone State on a plate: "Medical cannabis offers a new way for Pennsylvania residents to seek relief from symptoms of 17 serious medical conditions, like cancer." Drivers in the Philadelphia region should start seeing the electronic billboards "along major expressways" by Oct. 2, according to a Cresco spokesman. Statewide, the ads are being launched Sept. 27. All of the marketing materials were approved by the state Department of Health. The ads mention the company's name but don't attempt to steer potential patients to any particular outlet. By state law, dispensaries may advertise but they can't offer promotional specials, giveaways, or coupons. Without any state-approved medical marijuana for sale — and none expected to be available until early 2018, at the earliest — the campaign might seem premature. But Bachtell said the program's success will depend on patients' determining whether they have one of 17 qualifying conditions, talking to their physicians about whether medical marijuana is an appropriate treatment, and convincing medical professionals to sign up for the course that will allow them to recommend cannabis to their patients. "It's not too early because this is not a product-focused campaign. It's to let people know about the program," Bachtell said. "You can't start this early enough." The qualifying conditions include terminal illness, cancer, post-traumatic stress disorder (PTSD), glaucoma, autism, multiple sclerosis, amyotrophic lateral sclerosis, and neuropathic pain or pain that is not treatable with opioids. Cannabis grower Cresco Yeltrah is launching an advertising campaign on Sept. 27 to alert Pennsylvanians about the state’s medical marijuana program.